In recognition of the 50th anniversary of the death of the Rev. 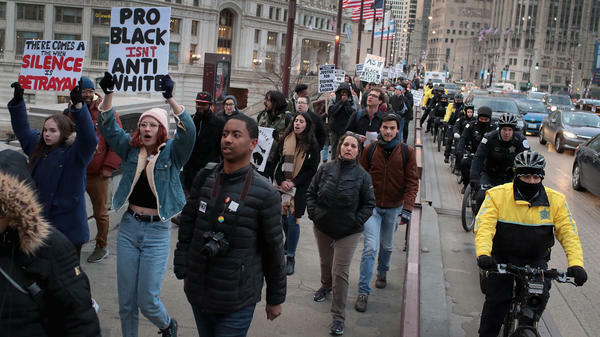 Martin Luther King Jr., and in solidarity with the family and supporters of Stephon Clark and others killed by police, demonstrators protest and march in the Magnificent Mile shopping district on April 2, 2018 in Chicago. With the rise of videos showing violent and often deadly encounters between police and citizens, there's also been an increase in the creation or expansion of civilian oversight groups to monitor police departments. Today, there are about 18,000 police departments in the U.S. and, according to the National Association for Civilian Oversight of Law Enforcement, there are about 200 civilian groups that monitor police. In Chicago, residents are calling for sweeping changes and worked for months to design a new way to monitor police behavior. After months of discussions and meetings, there are four dueling proposals for a new police watchdog agency in Chicago that more actively involves citizens. Two proposals — favored by Chicago's mayor — are modeled after civilian oversight groups in Seattle and Los Angeles County. They recommend and review police procedures, but serve only in an advisory role. Two other proposals offered by community groups give citizens a much more hands-on approach. MeCole Jordan, a spokeswoman for the Grass Roots Alliance for Police Accountability, said citizens must have more of a say-so when it comes to how Chicago police operate. "When policies are drafted outside of community input we have a slew of consequences that our community bears the brunt of," Jordan said. The GAPA proposal calls for electing people to a board which would have the power to select and remove the police superintendent. Then there's proposal number 4: the Civilian Police Accountability Council. "CPAC is about something all together different," said Larry Redmond, who is with a group pushing for it. "We are talking about ending the power structure as it currently exists." Community control, said Redmond, rather than oversight. It's a controversial proposal that give citizens the power to also investigate officers. Officials with NACOLE say it's often volatile incidents that spur cities to set up or expand civilian oversight operations, but there's often push-back by police. Kevin Graham, head of the Fraternal Order of Police in Chicago, said when it comes to monitoring police and the job they do, it should be left up to professionals familiar with police operations. "When you have civilians, I'm sure they watch a lot of television," he said. "I'm sure they have well-meaning interests, but the reality is they don't know how a police department works." Barbara Attard, an accountability and police practices consultant said civilian oversight is always evolving, "and it's always a negotiation. It's a negotiation between the government, the police union and the community." NACOLE said civilian oversight board members often go through extensive training to understand police policy and procedures. Public hearings resume Tuesday in Chicago. The first one was contentious from the very start as people packed an assembly room and argued about the meeting process. One woman, Armanda Shackelford, angrily charged that police had abused her son. "This need to stop, police need to be held accountable," she said. As negotiations continue in Chicago over which model is best, all involved say it's a given that there will be a new civilian police oversight body here. It's just one of many steps underway in the attempt to build a more trusting — or at least respectful — relationship between the city's police and its residents. Residents of Chicago are wrestling with a question. We've all seen video of alleged police violence against civilians. But what to do with that knowledge? In Chicago, residents worked to design new ways to monitor police behavior, and now they face a battle over which works best. NPR's Cheryl Corley reports. CHERYL CORLEY, BYLINE: After months of discussions and meetings, there are four dueling proposals for a new police watchdog agency in Chicago that more actively involves citizens. Public hearings resume tomorrow. The first one was contentious from the very start as people packed an assembly room and argued about the meeting process, and one woman, Armanda Shackleford (ph), clearly angry, charged that police had abused her son. ARMANDA SHACKLEFORD: This need to stop. Police need to be held accountable. CORLEY: There are about 18,000 police departments in the U.S. The National Association for Civilian Oversight of Law Enforcement, or NACOLE, says there are about 200 civilian groups that monitor police. Barbara Attard, an accountability in police practices consultant, says civilian oversight is always evolving. BARBARA ATTARD: And it's always a negotiation. It's a negotiation between the government and the police union and the community. CORLEY: Two proposals favored by Chicago's mayor are modeled after civilian oversight groups in Seattle and Los Angeles County. They recommend and review police procedures but serve only in an advisory role. Two other proposals offered by community groups give citizens a more hands-on approach. Mecole Jordan is a spokeswoman for the Grassroots Alliance for Police Accountability, or GAPA. She says citizens must have more of a say-so when it comes to how Chicago police operate. MECOLE JORDAN: When policies are drafted outside of community input, we have a slew of consequences that our communities bear the brunt of. CORLEY: The GAPA proposal calls for electing people to a board which would have the power to select and remove the police superintendent. Then there's proposal number four. LARRY REDMOND: CPAC is about something altogether different. CORLEY: Larry Redmond is with a group pushing for what it calls a Civilian Police Accountability Council, or CPAC. REDMOND: We're talking about ending the power structure as it currently exists. CORLEY: Community control, says Redmond, as opposed to oversight. It's a controversial proposal that gives citizens the power to also investigate officers, as well. Officials with NACOLE says it's often volatile incidents that spurs cities to set up or expand civilian oversight operations. But there's also pushback by police. Kevin Graham, the head of the Fraternal Order of Police in Chicago, says when it comes to monitoring police and the job they do, it should be left up to professionals familiar with police operations. KEVIN GRAHAM: When you have civilians - hey, I'm sure they watch a lot of television. I'm sure they have well-meaning interests. But the reality is, they don't know how a police department works. CORLEY: NACOLE says civilian oversight board members often go through extensive training to understand police policy and procedures. As negotiations continue in Chicago over which model is best, all involved say it's a given that there will be a new civilian police oversight body here. It's just one of many steps underway in the attempt to build a more trusting, or at least respectful, relationship between the city's police and residents. Cheryl Corley, NPR News, Chicago. You can read more about that story at our website, npr.org. And, of course, you can follow us on all the social places. We've got a Facebook page. You can follow us on Twitter. David is @nprgreene, with an E. Don't forget the E. You can find me, @rachelnpr. INSKEEP: Also with an E.
MARTIN: Also with an E. Yeah. Just one. INSKEEP: But not on the end. MARTIN: Steve, @nprinskeep. And, of course, Noel King is @noelking. INSKEEP: Anyway, we look forward to talking with you. Transcript provided by NPR, Copyright NPR.